If your business has gone through a fire-related disaster, you understand how overwhelming and devastating it can be. Not only can expensive equipment be destroyed, but it can severely damage your business’s productivity. 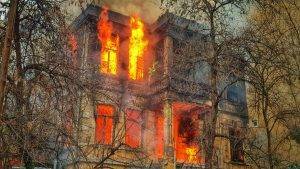 Therefore, you’ll want fast, high-quality fire damage restoration services. Here at DriForce, we offer our services 24 hours a day, 365 days a year. So, when disaster strikes your business, DriForce is only a call away and always available to help. When there is fire damage at a business or office, it is important to get fire restoration experts on site as soon as possible, especially if there is damage to windows, walls, or roofing as this will leave the interior of your business exposed to outside elements. When you call DriForce, we will be on scene as soon as possible. Our licensed and certified experts have years of experience in commercial fire, smoke, and soot restoration, and can effectively and quickly survey the site and determine the damage caused by smoke, fire, heat, and moisture. Our skilled technicians can also identify and eliminate hazardous gases, chemicals, odors, and stains that often result from fire damage. When you call DriForce to handle your commercial fire damages in Metro Detroit, you can be confident that your business will be thoroughly cleaned, so it’s safe for you and your employees to return to. Board-Up and Temporary Repair Services: Our fire restoration experts are fully equipped and ready to respond quickly with the right materials and tools to secure any size fire and smoke-damaged areas within your commercial property. Fire and Smoke Damaged Debris Removal: Materials that have been directly damaged by the fire must be properly removed and replaced to protect the structural integrity. Our commercial fire and smoke restoration experts will evaluate and test damaged materials, and if they are structurally sound, a smoke and soot removal process will begin. At DriForce Emergency Services we use the latest state of the art fire and smoke removal machines, HEPA vacuums and industrial strength chemicals to thoroughly clean affected materials. Deodorization, Soot, and Smoke Odor Removal: After thoroughly cleaning all exposed surfaces, our smoke and soot restoration experts will thermally fog your entire business site with odor-eliminating chemicals to restore your business to like-new again. Ozone machines and HEPA air scrubbers may also be used in certain circumstances to assist in the odor elimination process. If you or someone you know has been a victim of commercial fire damage, contact us today at DriForce. DriForce will get the job done quickly and thoroughly, so you can get your business up and running as quickly as possible. Hire the fire damage restoration company that will not only do the job quickly, but give you high-quality results. Don’t stress—get your business up and running again with DriForce. Contact us today at (877) 638-0081 to get your commercial fire damage restoration process started, or fill out our online form for a free estimate.